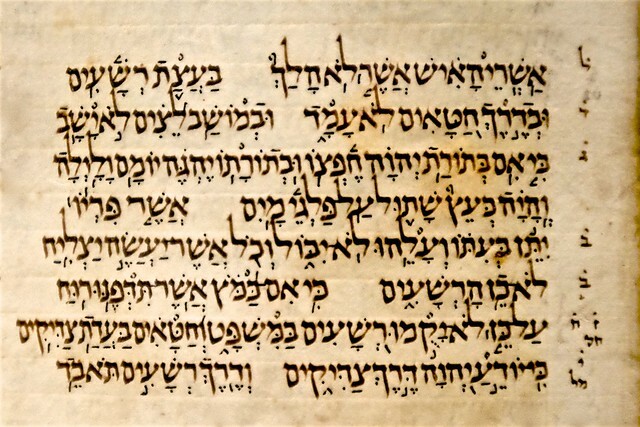 The Keter Aram Tzova – also known as the Tikun Ben Asher and the Aleppo Codex – is a manuscript of the entire Tanach, written in Teveria in the early 10th century. The text of the Keter was written by Shlomo ben Buyach, and it was then checked and corrected by Aharon ben Moshe of the Ben Asher family.1 Aharon Ben Asher also added the vowels and cantillation marks, as well as the masoretic notes in the margins. After Aharon Ben Asher died, the Keter was brought to Jerusalem, and shortly afterwards it was stolen and taken to Egypt. The Jewish community of Cairo redeemed the Keter, and it stayed in Egypt for about 300 years. At some point during the 14th century it was taken to Aleppo (in Syria) by a descendant of the Rambam. The Jewish community of Aleppo – who called their city “Aram Tzova” – safeguarded the Keter until 1947, when it disappeared during anti-Jewish rioting. There are several different versions of the account of the Keter during the riots and the following ten years – including its exact whereabouts and how much of it remained intact at any given time. We do know that somehow one third of the book (the beginning and end) was lost or destroyed, but it remains unclear exactly what happened to the missing pages. In 1957 the Keter was smuggled out of Syria and brought to Israel, where it eventually went through a restoration and preservation process. After the restoration, the pages were photographed to create a facsimile edition for study and research, and the original was placed in the Shrine of the Book, in the Israel Museum in Jerusalem. Although there were conflicting opinions regarding the “correct” masora, there are ways to compare different texts written at that time to evaluate their authority from a halachic perspective. One approach is to check for internal consistency – to compare the text of a given manuscript against the various masoretic notes in that same manuscript. Most manuscripts with masoretic notation have many instances where the actual text does not follow the accompanying masora.3 These differences may be deliberate – when the author or editor wanted to preserve alternate traditions in the marginal notes. It is also possible (and in some cases highly probable) that the inconsistencies are due to scribal error. In contrast, the Keter contains almost no disagreements between the text and the masoretic notes. Ben Asher diligently proofread the text many times to make sure there were no careless mistakes. He also resolved any conflicts between the various earlier traditions to create a halachically authoritative text. Although the Keter is unique in its halachic authority, there were periods in its existence where it was not accessible to many Jewish communities. The next post will address the problems of transmitting the masora without one definitive template, as well as how to reconcile conflicting masoros.